Guests of ANHC’s Spring Brunch fundraiser browse the rows of items available for bidding through the silent auction. With the promise of spring in the air, accompanied by a beautiful clear blue sky, no one can deny that March 23 was a gorgeous day for giving. More than 200 guests attended the Alaska Native Heritage Center’s Spring Brunch fundraising event. The collected donations will be used to fulfill the center’s mission to preserve and strengthen the traditions, languages, and art of Alaska’s Native people, through statewide collaboration, celebration, and education. ANHC is a nonprofit organization that serves as a resource for generations to come, ensuring that Alaska Native culture and traditions can be carried on through education and demonstration. To serve its mission, ANHC relies on funding sources like those of the people who generously gave from their hearts and wallets at the event. Guests were treated to a real-life demonstration of their gifts being put to use: Christianna Cliver, a junior at Bartlett High School and this year’s winner of the Native Youth Olympics logo contest was awarded a $1,000 scholarship from ANHC during the event. She has been an intern with ANHC for more than two years and has made significant contributions to the center particularly through her design work. In a show of support and appreciation for her time and effort, ANHC granted this scholarship to assist in the continuance of her educational journey. In her acceptance speech, Cliver discussed the impact that art has had on her life; she has gained confidence in her craft and found the bravery to share her work through her experiences in classes at ANHC. Another special treat was the keynote address, delivered by Yup’ik and Inupiaq artist Drew Michael, who was born in Bethel and raised in Eagle River. He demonstrated vulnerability as he decided to speak his Yup’ik language for the first time publicly, as part of his speech. It is stories like Cliver’s and unforgettable moments like Michael’s that reassure us that supporting culture is impactful. 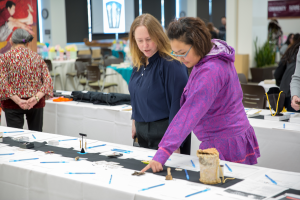 Through these contributions of time, resources, and energy, ANHC is able to be a showcase for learning, teaching, and sharing Alaska Native cultures. The event surpassed its fundraising goal of $40,000, and ANHC is extremely grateful to all who volunteered and attended.